"Kushan Empire. Huvishka. Circa AD 152-192. AV Dinar (19mm, 7.85 g, 12h). Nimbate, diademed, and crowned half-length bust of Huvishka facing on clouds, head left, holding mace-scepter in right hand, left hand on hilt; flames at shoulder; pellet on cheek / Siva, nimbate, standing facing, head left, pouring water from flask and holding vajra (thunderbolt), trident, and holding a he-goat; tamgha to left." "Kushans. Huvishka I. Circa 152-192 AD. AV Dinar (7.67 gm, 12h). FAONANOFAO OOHFKI KOFANO, Huvishka riding an elephant right, holding trident in his right hand, elephant goad in left / hPAKLIO, Eraklio (Herakles) standing left, wearing lion's skin headdress, holding club in his right hand, uncertain object in left; tamgha to left. 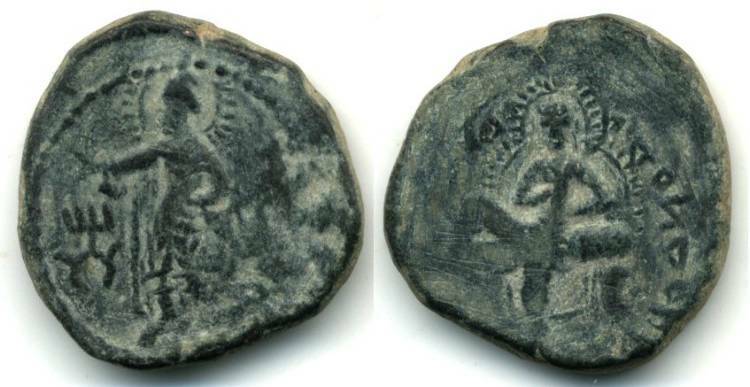 This coin depicts the god Vajrapani, Buddha's protector, as Herakles, assimilated through Gandharan art via the Parthian representation of Verethragna as Herakles (see Errington and Cribbs, eds., The Crossroads of Asia: Transformation in Image and Symbol in the Art of Ancient Afghanistan and Pakistan, pg. 132, 134).... 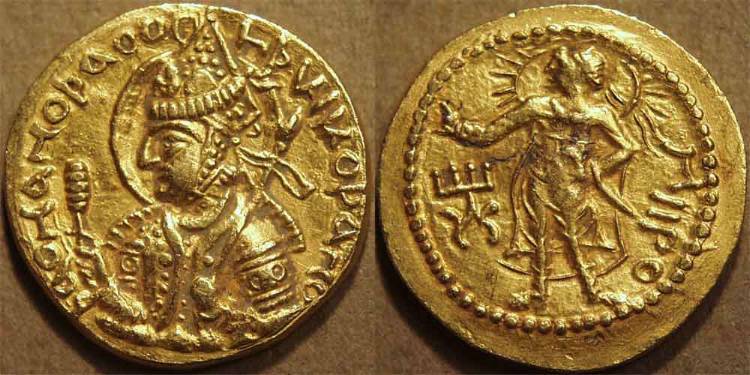 Unlike other issues depicting Vajrapani as Herakles, on this coin the deity wears the lion's skin rather than holds it. Also, the tamgha on this piece is that of Kanishka, thus suggesting an early issue of Huvishka." "Kushan Empire. Huvishka. Circa AD 152-192. AV Dinar (20mm, 7.96 g, 12h). Mint A. Nimbate, diademed, and crowned half-length bust of Huvishka facing, head left, holding mace-scepter and filleted spear over shoulder / APDOXPO, Ardoxsho standing facing, head left, holding laurel branch and cradling cornucopia; tamgha to left." 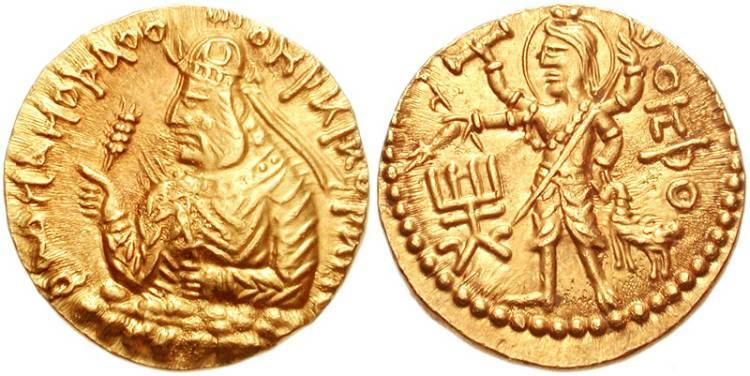 "Kushan: Huvishka AV dinar. Obverse: King's bust left, nimbate, holding sceptre and mace, Bactrian legend around: þaonanoþao oo...hþki Koþano. Reverse Mithra standing left, radiate, holding sword and granting blessing,Legend at right: MIIPO, Kanishka (!) tamgha at left. Date c. 150-191 CE. Weight 8.02 gm." "Kushan Empire. Huvishka. Circa AD 152-192. AV Dinar (7.81 gm; 21 mm). Mint II (B). Crowned and diademed bust left on clouds, holding mace scepter and sword hilt / Miiro, nimbate and diademed, lunar "horns" at shoulders, standing facing, head left, extending hand in benedictional gesture and cradling globe-tipped scepter; tamgha to left." "Kushan Empire. Huvishka. Circa AD 152-192. Gold Dinar (7.84 gm; 20 mm). Mint II (B). Crowned and diademed bust left on clouds, holding mace scepter and sword hilt / Nana, nimbate, standing right, holding box and scepter." "Kushan Empire. Huvishka. Circa AD 152-192. AV Dinar (22mm, 7.92 g, 12h). Mint B. 3rd emission. Nimbate, diademed, and crowned half-length bust of Huvishka facing on clouds, head left, holding mace-scepter in right hand, filleted spear in left over shoulder; pellet on cheek / Pharro (Hermes-Mercury), nimbate and wearing winged petasos, standing facing, head left, holding purse in extended right hand and filleted scepter in left; tamgha to left." "Large bronze tetradrachm (?) of Huvishka I (ca.152-192 AD), Kushan Empire. King seated cross-legged, right. Bactrian legend / God Pharro (with very Iranian hairstyle) holding fire in right hand, trident (?) in the left field. 26mm, 14.6 grams." "Kushan: Huvishka Gold dinar, Serapis reverse. Obverse King's bust left, not nimbate, holding goad and mace, Bactrian legend around: þaonanoþao o...ohþki Koþano. Reverse Serapis seated facing on throne, feet resting on foot-stool, holding diadem and staff, Legend at right: CAPA?O, Kanishka (!) tamgha at left. Date c. 150-191 CE. Weight 7.54 gm. Diameter 19 mm." "Huvishka AE tetradrachm, King on couch / Mao. 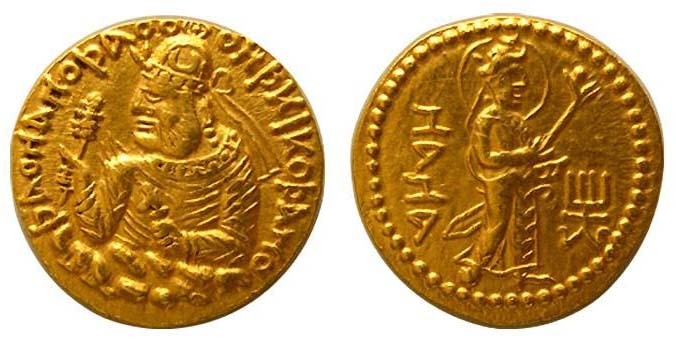 Obverse King reclining on couch facing, whole body nimbate, Bactrian legend around: þaonanoþao oo...hþki Koþano. Reverse Lunar deity Mao standing left, lunar crescents on shoulders, holding sword and conferring blessing, Legend at right: MAO, tamgha at left. Date c. 150-191 CE. Weight 9.79 gm. Diameter 23 mm." "Kushan Kingdom AE28 Huvishka. Date: 158-195 AD. 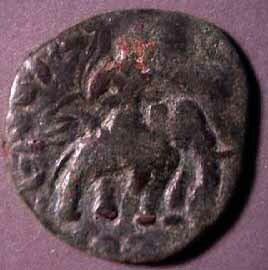 Obverse: King on elephant right. Reverse: Lunate moon goddess Mao standing left. Size: 26.34 mm. Weight: 10.8 grams. 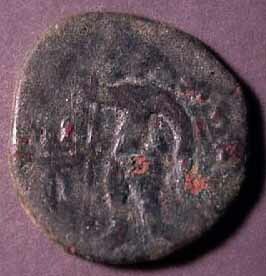 Description: A nice example from the Taxila mint." 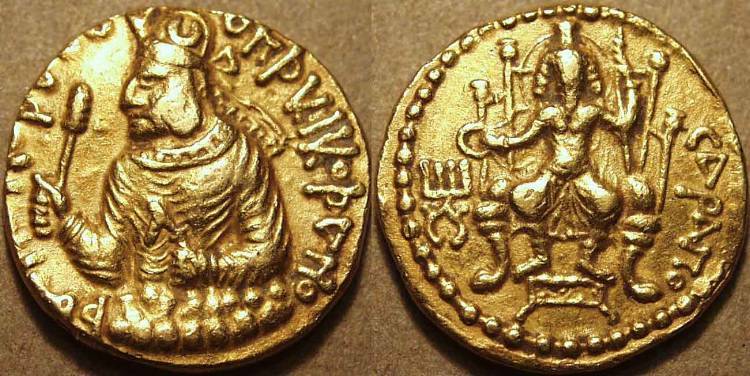 "Kushans, Huvishka I. Circa 126-164 AD. AE 26 mm. King seated on elephant right. Shiva standing left with two arms holding trident."